Filter cloth, a special grade of industrial woven wire cloth also commonly referred to as Dutch weave, is used for general filtration including the separation of solids from fluids (liquids or gases). UNIQUE Wire Weaving manufactures filter cloth in many of the primary metals as well as the exotic and specialty alloys. Regular filter cloth is constructed based on utilizing a greater number of finer wires in the shute (or fill or weft) direction, woven into a lesser number of heavier warp wires. It is woven in both plain and twill weave patterns, and produces a relatively heavy or thick mesh, that is much stronger and more durable than a comparably rated square weave mesh. UNIQUE Micronique Filter Cloth (UMFC) was an original development of UNIQUE. A series of specifications for filtering in the very fine range, down to 10 micron particles, UMFC utilizes much finer wires and higher mesh densities than regular filter cloth. Almost like sheet metal, it has the bending properties and thickness of thin cardboard. Standard Guide ASTM E2814 covers filter cloth by introducing standard terms and definitions, observes common technical considerations that a user should be aware of, and presents a mathematical model that can be used to predict the micron retention of a filter cloth specification. Filter cloth is normally rated by pore diameter, or its particle size retention capability, expressed in micrometers. The micron retention of a filter cloth specification can be determined by the use of a glass bead test or a bubble point test (ref. capillary flow porometry), depending on the degree of fineness. Standard SAE ARP901 presents a test method and procedure for measuring the largest pore in a filter cloth sample. 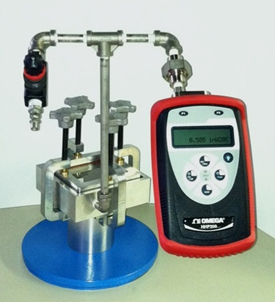 The sample is mounted in a test fixture, immersed in a test fluid, air pressure is slowly applied to the fluid, and the pressure is determined when the first air bubble location is observed. This test method offers a comprehensive review of bubble point testing physics, and corrects for test fluid surface tension, immersion depth, and temperature. The test fundamentally determines a pressure, which must be converted to a pore diameter by mathematically applying a geometric standard constant or tortuosity factor, defined as the ratio of the tortuous pore path length a particle must follow to the actual filter cloth thickness. ARP901 suggests a tortuosity factor of 207 be applied to the pressure to calculate a pore diameter in micrometers. If you are interested in purchasing one of our custom designed bubble point test fixtures, please contact us.